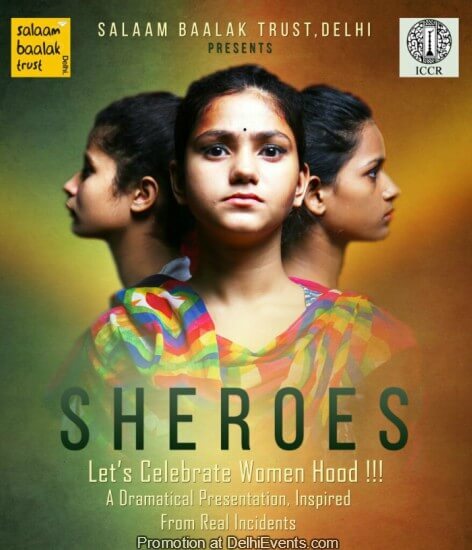 Event Description : Salaam Baalak Trust (SBT) presents ‘Shereos’ Hindi Play depicting the burning issue of gender discrimination. Revolving around the struggle of three girls Mary, Aarti & Fatima to break the shackles of social stereotypes, it has been written, acted, and directed by the children and alumni of SBT. Background : At SBT, we strongly believe and have thus imbibed the spirit of performing arts within our systems. You would be glad to know that Salaam Baalak Trust was the first Indian NGO to be awarded a rare honour of US President’s Committee on the Arts and Humanities, USA, on November 11, 2014 . Since our first production in December 1989, directed by Barry John, each year, our children come together to weave a magical evening of dance, music and drama, reaffirming each time that if given the opportunity each child is a powerhouse of possibility.